Inventory We are a resale marketplace, not a box office or venue. Ticket prices may exceed face value. This site is not owned by Scotiabank Saddledome . 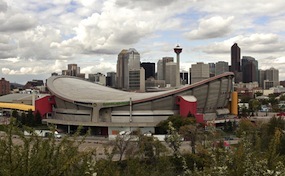 The Scotiabank Saddledome is an iconic looking venue located on 555 Saddledome Rise Southeast Calgary, Alberta, Canada. The Saddledome is home to the National Hockey League's Calgary Flames. The Scotiabank Saddledome box office provides a seating capacity of 19,289 for all hockey games. The venue opened October 15, 1983 at a construction cost of 97.7 million. It has been known in the past as the Pengrowth Saddledome and the Olympic Saddledome (as it was built for the 1988 Winter Olympics). Outside of the Olympics the Scotiabank Saddledome tickets have included the NHL All-Star Game, NHL Draft, Stanley Cup Finals, WHL playoffs (including a record crowd for the league), and many other of the best concert performers in the world. Scotiabank.SaddledomeCalgary.com is not currently affiliated with any primary box office, supplier, or official website. We offer online access to a wide array and low prices for all secondary market events. Prices can fluctuate above and below face value as all inventory is listed to the current market. To purchase tickets for all Scotiabank Saddledome events you can follow the easy to navigate steps online or pick up your phone at anytime to speak with one of our operators.